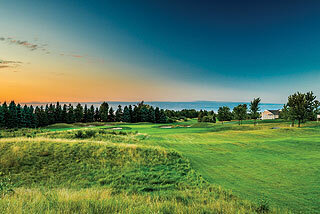 The photos in this review are of the Wolverine at Grand Traverse Resort. 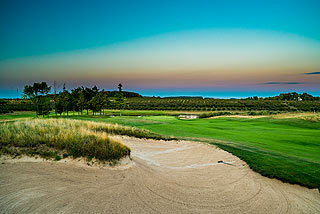 The NEW Grand Traverse Resort in Acme is located just a couple miles east of Traverse City. 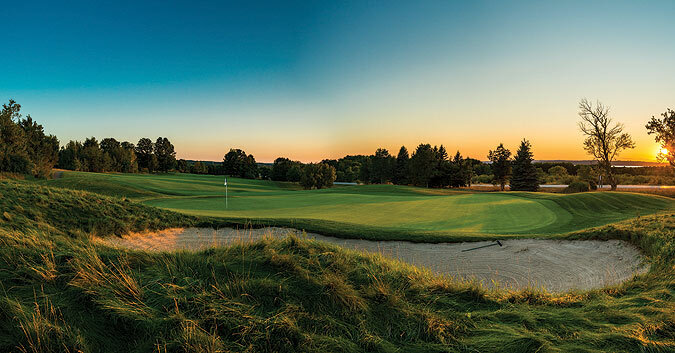 NEW because of the extensive 14 million dollar renovation that the property recently underwent - to make it the most upscale golf resort in Michigan! On property are 600 well appointed guest rooms, three championship golf courses, a full service spa and fitness area, Wi-Fi throughout the property, a grand lobby with lounge, magnificent beach club, outdoor pool, indoor pool area with free form pool and large lap pool, indoor and outdoor tennis courts, locker rooms with saunas, game rooms, fine and casual dining (6 restaurant/lounges), an array of retail stores including a deli with Starbucks coffee, 85,000 square feet of flexible meeting/conference space - and free shuttle to the Turtle Creek Casino just a few miles away! 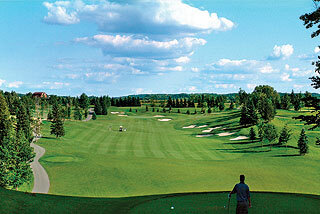 For more information on Grand Traverse Resort - click here. We spent 4 nights at the resort and played golf each day. It is an incredible convenience to have your clubs stored and to simply walk to the pro shop each morning (perhaps grabbing a Starbucks along the way) - with attendants having everything set up and ready for you to hit some balls and to enjoy a challenging round on one of the three beautiful golf courses. Looking to tone up your game? 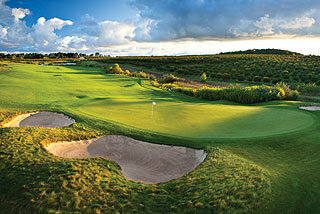 The Jim Mclean Golf Schoolis on property with a variety of individual and group instruction and clinics available. The practice facilities are comprehensive, with a spacious targeted grass range (stacked with complimentary balls), short game area plus putting greens. The clubhouse includes a well stocked pro shop - with the latest in equipment, accessories and beautiful Grand Traverse Resort logo attire. The service is outstanding as the attendants genuinely go out of their way to make sure all is in place. Example - during our visit a young customer had forgotten to wear a collared shirt (which is required) and the pro shop was kind enough to "loan" him a shirt so that he would not have to miss his tee time. A restaurant/lounge is also part of the clubhouse, with a varied lunch menu on tap. 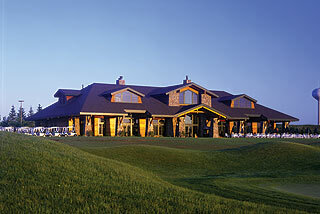 The spacious outdoor patio is a great meeting spot, with wonderful views of the opening and closing holes of the Bear. The golf carts are equipped with ball and club washers, and the Kirby Marking System is in place, with measurements every 25 yards from 200 to 100 yards (250 on par fives). The Wolverine also has sprinkler heads that are measured to the center of the green. Scorecards have pin placement and green depth information, as well as diagrams of each hole. 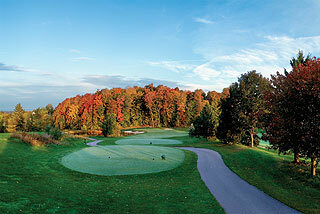 The Wolverine is a Gary Player championship design that was added to the property in 1999. This layout provides a completely different experience than the Bear, as the links style provides ample recovery room along the rolling fairways and manicured green complexes as long as you keep the ball out of the tall native high grasses). 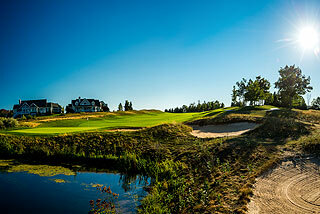 The front nine weaves along water hazards and wetlands, while the back side is more wooded and plays into the highland portion of the property. This course is well bunkered - with 79 sand traps situated along the fairways or greenside, and water hazards come into play on 11 holes. 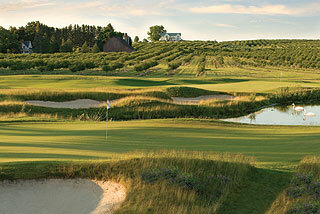 The large undulating green complexes are flanked by mounds and fescue rough, creating the need for accurate approaches. Leave it short and there is a good chance for recovery however, as the fronts are usually open, inviting a variety of chips and pitches. The back side is much more rolling - with some significant elevation changes from tee to green. There are 4 sets of tees that play to distances and slopes measuring 7043 yards/138 slope, 6487 yards/135 slope, 5888 yards/129 slope and 4941 yards with a slope of 125 for women hitting from the forward tees. This is a fine resort course - challenging from the two back sets and quite player friendly from the white tees and for women. Golfers of all skill levels can enjoy a round here - though there is enough trouble in the form of water, sand and high grasses to challenge the best of players. Three 4 star (Golf Digest Places to Play) championship courses, great service, wonderful accommodations and amenities and great location - we highly recommend a stay here! For more info, visit our page for the course, with direct link to their website by clicking here.